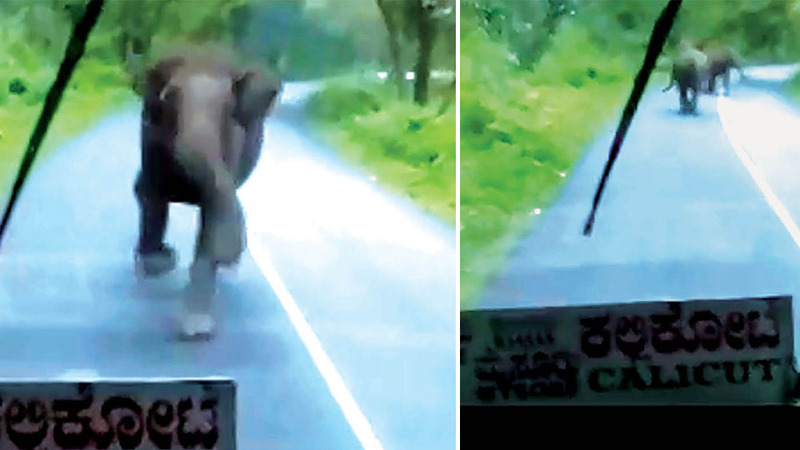 Gundlupet: A female elephant, which was crossing the road with her calf near Molehole in Bandipur Tiger Reserve on Sunday, chased the Calicut-bound KSRTC bus for a distance to allow her calf to cross the road. A video of the incident which went viral on the social media yesterday shows the mother and her calf trying to cross the road and as the bus neared them, the mother elephant chased the bus, forcing the driver of the bus to take the bus in a reverse direction. The elephant after chasing the bus to a distance went back to the calf which was standing on the road and went to the other side of the forest. Many passengers in the bus had captured the incident on their mobile phones. Meanwhile, Forest officials have warned motorists not to venture close to the elephants especially if there is a calf as there are chances of elephants attacking them to protect their young ones which is a natural instinct and added that the motorists should remain silent at a safe distance and proceed further only after the elephants move away with the young ones. H.K. Patil likely to be KPCC President?